This inflatable bumper ball soccer is for adults and kids (just different size), and it can be extensively put in some relaxation occasions like parks, squares, gardens or family backyards, or some other playing centers etc; Adults and children will have very good time with this fun. 1. 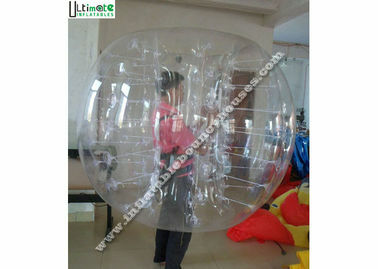 Catalog: Most of our inflatable product range are shown in the website. If you need our complete catalog, please send your email to admin@cnbouncer.com, and we will be very glad to answer any questions promptly. 2. Custom design: Like OEM above described, custom design, based on our recommendation, will be applied as per clients’ requirements. 3. 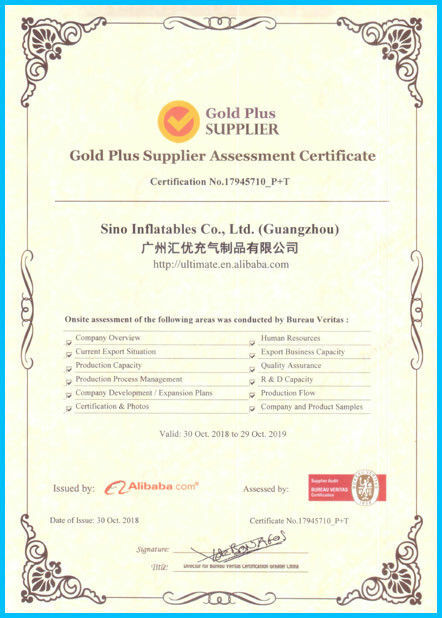 Material: All of the inflatables are made of top quality PVC Tarpaulin, which are flame retardant, water proof and certified lead free, and they all meet EN71-2-3 with SGS test report past. 4. Logo: We can put clients’ logo on almost all inflatable products as long as you show us the logo you have, by digital printing, silk printing, or hand painting . 5. Complete equipments: Inflatables, certificated blowers, repair kits( related repair material, glue etc), ground sheet( if designated). 6. Guaranty: We provide our customers with 3 years limited guaranty, such as sending us back the goods for repairing, or replacement warranty, or repair compensation etc as long as it's our products' quality problems. 7. 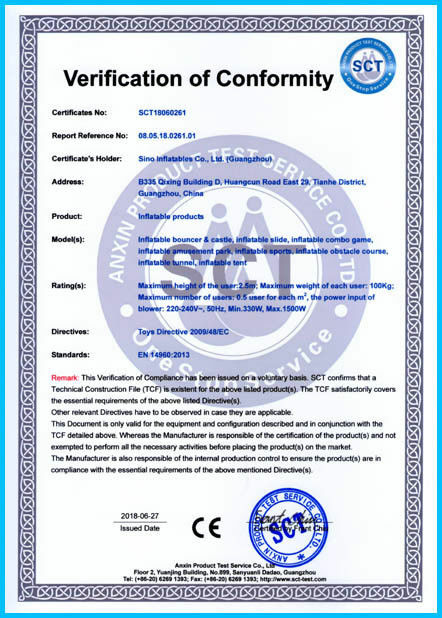 Blower certificate: According to different location, all of the blowers we provided will get to the customized requirements, which can be CE, UL, GS etc certificate approval. V. Shipping after balance receival. 9. Payment terms: T/T, trade assurance (Alibaba), western union, paypal, L/C. 10. Producing time: It will depend on order quantity, and sample order will range around from 2 to 5 days, which depends on the design and the dimensions. Accessories: Trampoline, pump, repair kits, simple logo.etc.